Many of us don’t know the amazing health benefits and medicinal uses of guava leaves so we never tend to use it. From promoting hair growth, treating skin problems to regulating blood sugar levels in diabetic patients and aiding weight loss, guava leaves does have amazing benefits. Guava leaf tea is consumed in many parts of the world to reduce blood sugar levels. Boiled guava leaf water is popularly used both for promoting hair growth in the form of hair rinse and also for treating skin infections. Guava essential oil got from the leaves also has amazing medicinal uses. The botanical name of guava tree is Psidium Gujava and the leaves are called amrood ke patte in Hindi and கொய்யா இலைகள் in Tamil. Traditionally guava leaf poultice is used for treating wounds. The water decoction of guava leaves is used as a gargle for removing plaque and also for treating mouth ulcers. It is also used for treating diarrhea and also for reducing blood sugar levels in diabetic patients. Fresh guava leaf juice is widely used for treating skin problems. The leaves of guava tree is rich in polyphenols which includes flavonoids (quercetin and it’s glycosides), tannins (amritoside, guavin, isostrictinin, strictinin, pedunculagin) and isoprenoids (monoterpenes, terpenoids). The major components found in guava essential oil are beta caryophyllene, alpha pinene and 1,8-cineole. 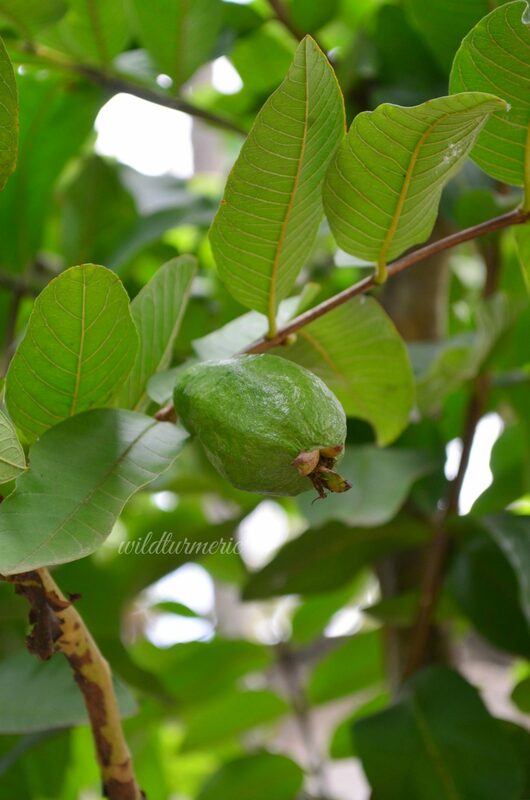 Along with the medicinal uses mentioned below, guava leaves also have anti malarial, anthelmintic (dispels worms), anti ulcer, antispasmodic, analgesic (pain reducing) properties along with effectively reducing menstrual pain. Guava leaf has been traditionally used for treating cough in many countries. When we consume guava leaf extract got by boiling the leaves in water, it reduces the frequency of cough greatly. In fact guava leaf has been used for treating many pulmonary diseases. Both the water extract of the leaves and the essential oil mixed in water can be used for treating cough. Guava leaf extract has amazing anti bacterial properties and it is the main reason why it is so effective for treating many skin problems including fast wound healing. It has been proven to be effective against many bacterial strains including Staphylococcus aureus, Escherichia Coli and Pseudomonas aeruginosa. You can read the study that proves it here. Another traditional use of guava leaf extract is for stopping diarrhea. Guava extract is so effective in treating diarrhea because it has amazing anti bacterial properties and inhibits the growth of all bacteria that causes diarrhea like Vibiro Cholerae, Aeromonas Hydrophila, Escherichia Coli, etc. 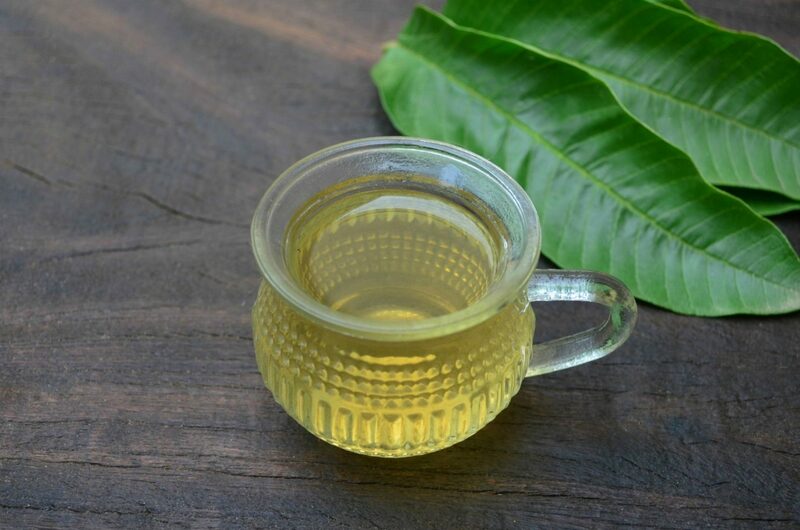 Having a cup of guava leaf tea is one of the best remedies for diarrhea. You can read the study that proves it here. Though guava leaf extract anti fungal properties is not as effective like it’s anti bacterial properties it is still very effective against some fungal infections. It has been proven to be effective against Candida Krusei and Candida Glabrata. The fresh leaf extract can be used for treating fungal infections effectively. Guava leaf extract has amazing anti cancer properties and has been proven to inhibit the growth many type of cancer cells. This is due to the presence of quercetin in guava leaves. 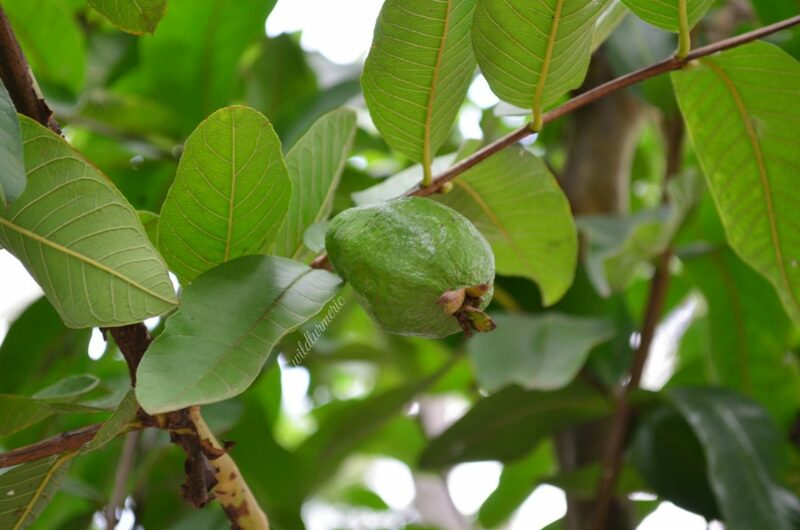 Guava leaf extract have been proven to be effective against nine human cancer cell lines ! This includes breast cancer, leukemia, ovarian, lung, prostate, ovarian, kidney and melanoma, you can read the study that proves it here. Guava leaf extract has been proven to reduce blood sugar levels and has been used for it for a very long time. The main active compounds that have been proven to have anti diabetic properties are gallic acid, catechin and quercetin. Diabetic patients who are suffering from high blood sugar levels will greatly benefit taking a cup of unsweetened guava leaf tea. It also prevents many of the complications associated with diabetics like diabetic peripheral neuropathy. Guava leaf extract has amazing cardio vascular benefits as it has a protecting effect along with reducing inflammation. Consuming guava leaf extract regularly prevents endothelial cell damage which is the main reason for atherosclerosis. Guava leaf extract also have anticoagulant properties in plasma so it greatly reduce cardio vascular complications. Guava leaf extract is also very rich in antioxidants. Guava leaf extract has been used for treating almost all dental problems from ancient times and this traditional use has been backed by research. When we gargle our mouth with guava leaf extract many magic things happen, it reduces the formation of plaque, delays the formation of dental biofilm along with preventing dental caries. This is due to the presence of flavonoids and tannins in the guava leaf. Since guava leaves have amazing antimicrobial properties, it is so effective for treating many skin problems including removing suntan and treating acne. Guava leaf extract inhibits the growth of propionibacterium acnes which is the main reason for acne flare ups. Since guava leaf extract have anti inflammatory properties, using it on acne prone skin will help both reduce the inflammation along with treating and preventing further acne breakouts. The leaf extract also can be used for treating all minor wounds and scrapes. Guava leaves have anti anemic properties so it prevents anemia which is the main cause for hair fall when consumed internally as a tea. Since guava leaves have antimicrobial and anti inflammatory properties, it treats almost all scalp problems and helps reduce scalp inflammation which is the main reason for hair fall. At home, I make a simple guava leaf hair spray for promoting hair growth and I have given the recipe for it below. If you don’t have access to fresh guava leaves, you can buy dried guava leaves online. You can use the dried leaves instead of fresh leaves to make hair growth spray. We also get guava leaf powder in the markets, you can use it to make hair packs and face packs. If you buy guava leaf powder, transfer it to an airtight box and store it in the fridge, it will last fresh for a long time. Finally guava leaves are dried, crushed and sold in the markets, perfect for making guava leaf tea. When you are buying guava leaves for making tea, make sure it is organic. Guava leaves have very low toxicity and is generally considered very safe and have literally no side effects especially if had in the suggested dosage. Since guava leaves reduces blood sugar levels, diabetic patients should monitor their blood sugar levels closely while consuming both guava leaf tea and diabetic medication together. 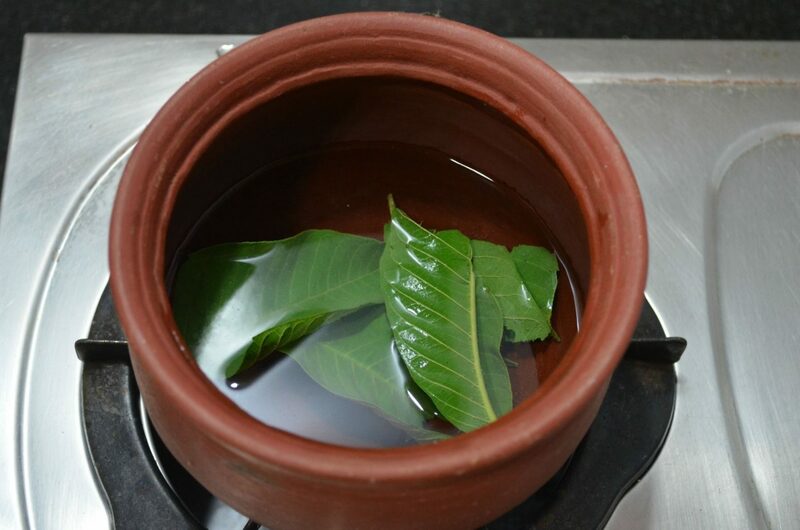 Usually we boil a cup of water along with one fresh guava leaf for making guava leaf tea, this amount is very safe. If you are using dried guava leaves for making the tea, use a tsp of the dried leaves for a cup of water. It is always best to start from a small dosage and increase it gradually so your body gets used to it. How To Make Guava Leaf Powder? To make guava leaf powder, collect fresh guava leaves and wash well to get rid of any dirt. Now wipe excess moisture using a soft cloth. Spread the leaves in a plate and keep it under hot sun for 2 to 3 days till they turn really crisp and no trace of moisture remains. Now while still crisp from sun drying, powder it in dry mixer, sieve and store. You can use this powder in hair packs. To use guava leaves for hair growth, take a 4 to 5 large guava leaves in a pot, boil it along with a cup of water for 5 minutes till the water changes color. Now switch off and let cool completely and strain. Now to the strained mixture, add few drops of rosemary essential oil and mix well. Pour this mixture in a spray bottle and use it for promoting hair growth. To use, spray this mixture on the scalp, wait for 15 to 20 minutes before having hair wash.
For making guava leaf tea, heat a cup of water in a pot and let it come to a rolling boil. Once it comes to a rolling boil, add one large fresh guava leaf torn into small pieces and switch off. Let it steep till the mixture comes to lukewarm temperature, strain and consume. This drink will reduce blood sugar levels significantly and it also reduces inflammation along with treating many other ailments. 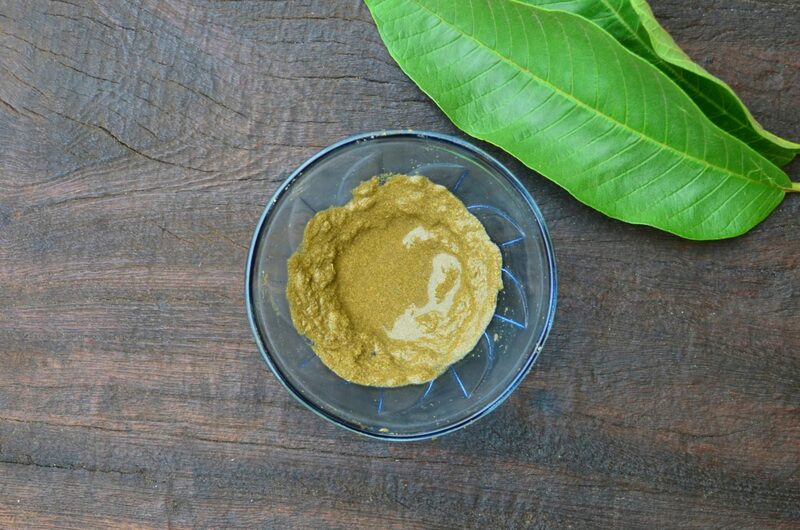 Since guava leaf has got amazing anti bacterial properties, it is so wonderful to use for skin care, I like to use guava leaf powder in face packs. To make the face pack, you can either mix guava leaf powder with rice water and apply as a pack or mix it with equal quantities of besan and rice water and apply as a face pack. Guava leaf face packs will treat acne, remove suntan along with fading all other blemishes well. 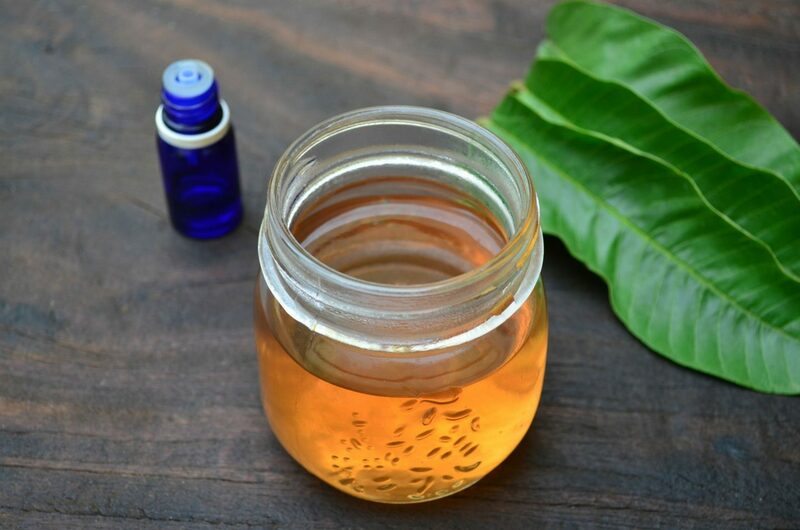 Guava leaf mouth rinse is one of the cheapest and most effective mouth rinses we can make at home for treating all dental problems. It greatly helps treat and prevent dental plaque, dental caries and mouth odor. To make the mouth rinse, take a cup of water along with 3 to 4 large fresh guava leaves and boil till the color of the water changes. Now switch off and strain, add in 1/8 tsp of Himalayan pink salt to it and mix well. Use this as a mouth rinse to treat all dental problems. 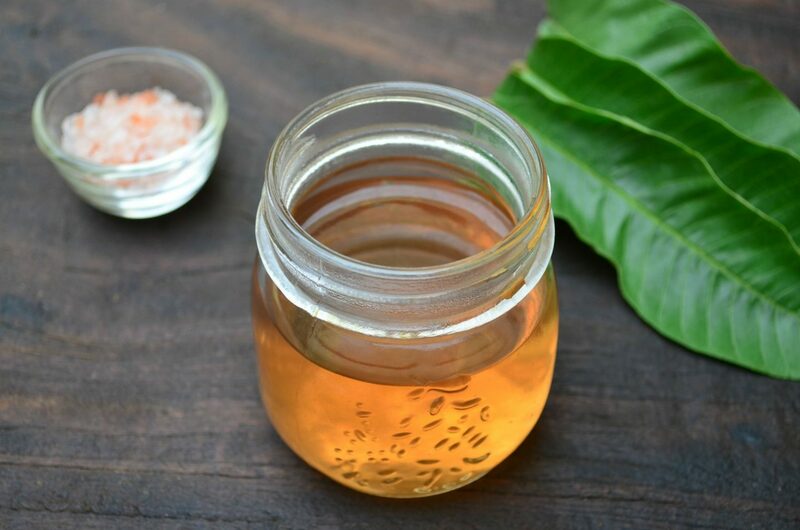 Guava leaf tea is rich in antioxidants, keeps our digestion in peak order, helps us sleep better along with stabilizing blood sugar levels making it one of the best teas to include in a weight loss diet. To make the tea, boil a cup of water along with 2 to 3 large guava leaves. Once the leaves come to a rolling boil, switch off, let cool and strain. Now add honey to taste and your amazing guava leaf weight loss drink is ready! This looks like mango leaf? I heard we can boil mango leaves and drink the water. Maybe you adapted this from the mango leaf methods and applied it to guava? How to tell the difference between the mango and guava leaves? It is looking just like a thoran. 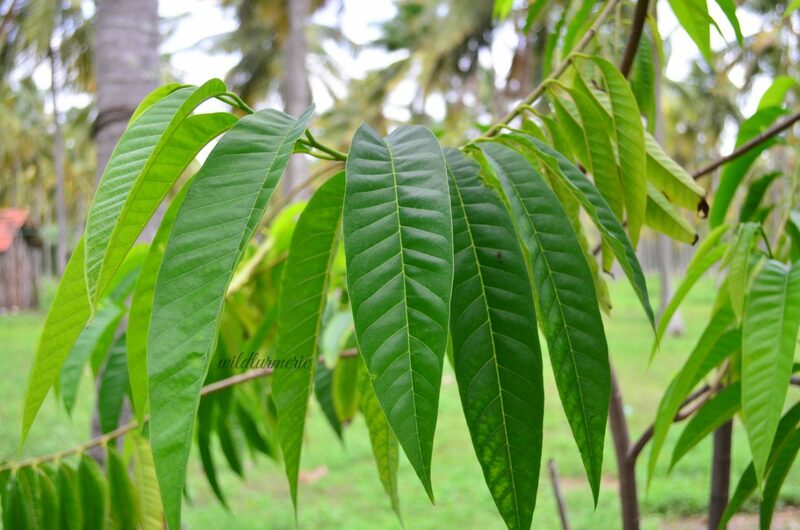 The third photo you have shown is not guava leaf. check it.